Although the dream of indoor tennis during the winter months at Stony Stratford Tennis Club became a reality in November, the official opening of the two new artificial clay courts within an Air-dome took place on Wednesday 10th December. The event and ceremony brought a huge turnout to welcome the opening of their new facility, including club members and guests of honour from project sponsors and supporters. The new courts will be in use all year round, whilst the Air-dome will be in place from November through March over the winter months, enabling tennis activities to continue through the worst of the weather. As well as being used by members and the Tennis Works Development Programme, a special community schools programme has been introduced as a thank you to the project supporters. Zak Jones who captained the Men’s Welsh Hockey team and is currently the Great Britain U21 Women’s coach and a keen tennis enthusiast, formally opening the facility. This was followed by John Cavill (Director of Tennis) leading some of the juniors through their paces on court. Simon Burn, SSLTC Chairman, summed up the mood of the club. 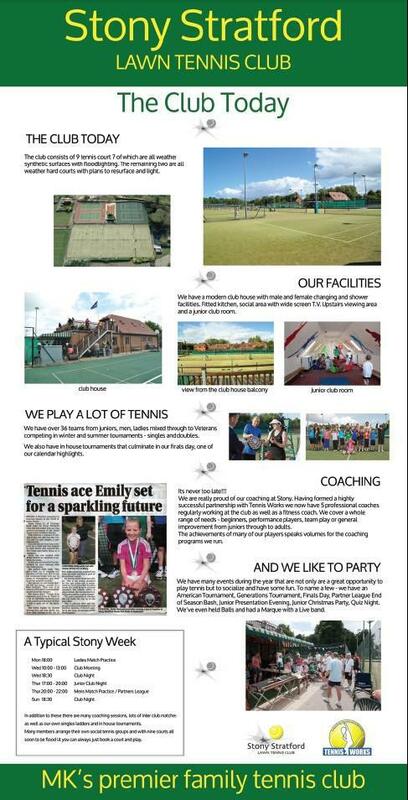 "We are delighted to be able to continue Stony's long tradition of offering the best tennis club facilities in north Bucks and South Northants. There is palpable excitement amongst the Stony members with the completion of two new artificial clay courts, floodlit and covered with an air dome for the winter. It will make a huge difference to young and old, beginner or aspiring star playing at Stony. We are indebted to the generosity and support of our large membership and to the National Hockey Foundation who have been hugely generous with their grant. Without them this would not have been possible nor our ability to further extend our offer of tennis into the community. We are also grateful to the Bucks LTA for their loan and continued support to develop tennis in Milton Keynes to the benefit of all playing at or visiting Stony Stratford Tennis Club"
Tony Billson, Chairman of the National Hockey Foundation says. " The National Hockey Foundation has been pleased to support this exciting project. We have been able to support several important sporting and social projects in Milton Keynes over the last few years and we see this as another opportunity to help the growth of sport and particularly the chance to encourage young people to develop their sporting talents. We are sure that this project will achieve ours and the clubs objectives." Melvyn Jones of Tennis Works and SSLTC who lobbied the project supporters throughout the fund raising stage acknowledged the fantastic support given. “After our own club members, it is amazing that the largest financial supporter was the National Hockey Foundation, they should be immensely proud of their desire to provide sporting facilities for youth in the area. We have a facility which will serve members and the community for many years to come”. Our business plan three primary goals are to maintain steady or improving funds to enable us to pay for our existing loan commitments and improvement projects/ events. We are doing this through the tactics of maximising court utilisation and targeting new members to maintain a membership profile that supports our objective. Secondly, to increase the value of membership to our members through the tactics of continuously improving our facilities, providing new opportunities for peer group tennis and keeping an active social committee. And thirdly, to retain as many members year on year as we are able through a new members induction programme and through goal two. Back in 2008 our membership was below 400, having declined two years running, albeit from a peak of 451 in 2006. Numbers reached a peak of 468 in March 2012, a record since the club’s inception in 1923. We are 92 this year! Our financial strength is driven not just by higher membership but careful renegotiation of contracts with suppliers, including insurers and lighting maintenance amongst others. Further success is shown by the number of coaching hours and with participants increasing dramatically. The number of members regularly playing social tennis, whether that be club mornings, afternoons or evenings, Partners, or other informal mix ins, increases every year. This growth is why we regarded it a priority to bring courts 8 & 9 into full usage with lights and a winter cover. 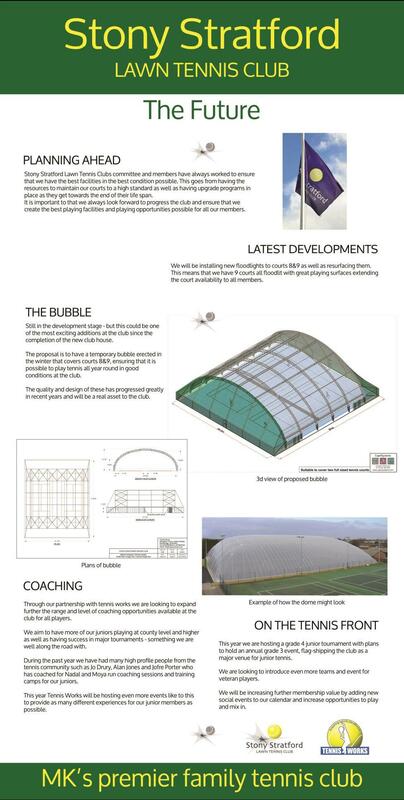 The new air dome and our brilliant artificial clay courts were formally opened by Zak Jones, GB U21 and National Premier Division's Buckingham Ladies Hockey Coach, on 10th December 2014. 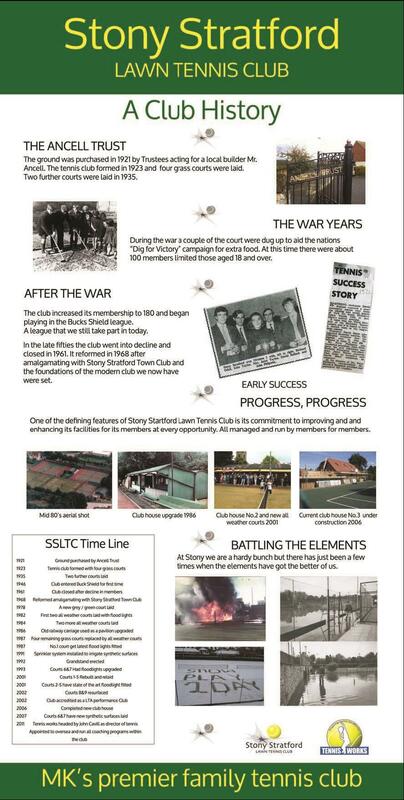 As outlined in the Blueprint for British Tennis, the LTA recognises the vital contribution that clubs like Stony make to our sport across the country. To build on this, the LTA are committed to supporting us in the development of SSLTC’s tennis programmes, coaches and volunteers, and in the provision of competitive opportunities for our members, particularly juniors. Increasing junior competition is a key focus of the LTA and is critical if British tennis players are to succeed at a world-class level. 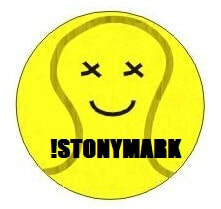 Stony has developed !StonyMark, documenting best practice policies and procedures for a club such as ourselves. Other sports have similar programmes for their clubs, for example ClubFirst in the Hockey world. Living by the standards we set ourselves ensures we meet the minimum standards required of us by the LTA to ensure their continued support for the tennis programmes SSLTC delivers on court, and the policies and procedures we have in place off court. These are crucial to ensuring that SSLTC is managed effectively and that we provide a safe environment for junior members to enjoy and play tennis. !StonyMark provides a framework for our club to improve ourselves, and to ensure that our programmes, policies and procedures are all in line with best practice. In continuing to achieve !Stonymark we are demonstrating our contribution the provision of tennis in the UK, by improving the quality of our club, our coaches that work within SSLTC and the competition that SSLTC delivers.